We saw Ocean’s 8 – good characters, not so interesting plot | Tales From The Ipe! Nums and I went to see Ocean’s 8 earlier this month on a Friday night. 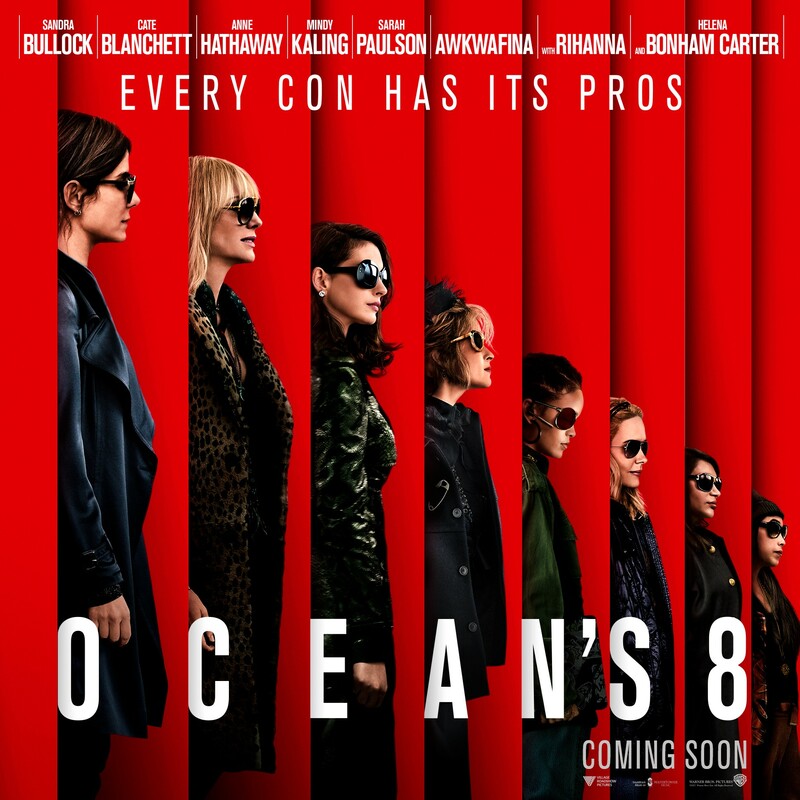 The film is a spin-off from Steven Soderbergh’s Ocean’s trilogy and features an ensemble cast, including Sandra Bullock, Cate Blanchett, Anne Hathaway, Mindy Kaling, Sarah Paulson, Rihanna, Helena Bonham Carter, and Awkwafina. Produced by Steven Soderbergh and Susan Ekins. The film revolves around Debbie Ocean, the younger sister of the late Danny Ocean. She is paroled from prison, and hunts down her former partner-in-crime Lou to convince her to join her heist that she planned while serving her sentence. The job? She plans to steal the Toussaint, a $150 million Cartier necklace, from the Met Gala in five weeks, and use Met Gala co-host Daphne Kluger (Anne Hathaway), a snobby actress, as an unwitting accomplice who will wear the necklace into the gala so they can steal it. Debbie and Lou assemble an interesting cast of characters to perform the job – someone who can get materials, a jeweler, a pick pocket, etc. While the plot is somewhat derivative of the prior Ocean heist films, the best part is having all of these actresses on screen. It’s definitely female-focused, which is unique and interesting. I wish the plot was more interesting. This entry was posted in Entertainment and tagged cate blanchett, drama, heist, movies, sandra bullock. Bookmark the permalink.